It’s funny how a career and an interview can be distilled into just a few paragraphs. Nothing is misquoted, but there is a lot more context to the printed comments. Here’s the full text from my emailed interview. My long responses were provided to atone for months of setting aside the questions. 1. Tell me about a favorite experience you had as a CEE student. 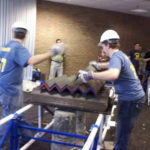 I was very involved in ASCE and the student project teams. My most memorable experiences mostly took place outside the classroom, in the ASCE student lounge and the Wilson Project Center. We also had a some epic adventures with the steel bridge and concrete canoe teams during the regional and national competitions. Of those experiences, the concrete canoe competition during my first year of grad school stands out. Most of the team that year, including myself, had very limited concrete canoe experience. We worked hard throughout the year learning about ultra-lightweight concrete, hull design, proper paddling techniques, and how to work as a team. It was a struggle. We completed the canoe only days before the race. The canoe was very unsteady and only had an inch of freeboard with four people paddling, but it floated! We entered the race day with low expectations. It was freezing the day of the race. I was nervous that the canoe wouldn’t hold up and my friends would be left swimming in the frigid water. I second guessed all the engineering decisions: Was the hull thick enough? Did we cut away too much of the freeboard when stripping the forms? There would be real consequences to these choices. For that reason, I credit the canoe competition for being the best preparation for an engineering career. We transported the canoe to the lake in a rented U-Haul. Although the canoe was less dense than water, it still took the entire team to carry the large boat. Getting it into the water without a mishap was a success in itself. The second challenge was the submersion test. After proving that no canoe would sink to the bottom of the lake we proceeded to the races. We finished last in the first race. The paddlers were having a terrible time steering the canoe. Despite several low finishes the entire team provided continuous enthusiastic encouragement. After lunch a family member arrived with a M flag and cowbell. That amped up the cheering session. With a tailwind of Go Blue chants, the woman’s sprint team managed to muscle out a third-place finish – by far the best showing of the day. I was so happy for our female teammates because they had given so much to the team all year long. At the end of the year, the team presented me with a signed canoe paddle. It’s one of my most treasured college artifacts. I learned a lot about leadership that year with the concrete canoe team. As my career leads me into more management roles, I’m now applying many of those lessons. I wouldn’t be the engineer I am today without the benefit of my ASCE and project team experiences. 2. Which courses and internships did the best job preparing you for your career? Anything by professor Wright. He literally wrote the book on concrete design – most of my colleagues use the same reference book. Professor Wright also knew how to present the material in a very practical way that is easily applied by professionals in the field. I also found Professor Hryciw’s foundation design course to be immediately useful. I still refer back to the notes prepared by both professors. Some of my favorite moments came in professor Katapodes fluid mechanics course. He frequently challenged the class to engage in conversation and would not move on until someone, anyone, took the bait. I was too impatient and frequently jumped in with a clueless answer, until he realized my game. One day he responded, “Ken, you are wrong. You have the opposite of the right answer. Thank you for being this wrong, because it really helps me proves this point about…” He knew I’d take it well. The exchange demonstrated the unique relationship we developed over the year. He also provided a lot of help and encouragement when I was ASCE president. I learned a lot from professor Katapodes, just not that much about fluid mechanics. 3. What do you do for Thornton Tomasetti? What are the benefits of working for a large company? I work in Thornton Tomasetti’s Chicago office in the Building Performance practice area. Thornton Tomasetti is structural consultant. Building Performance deals primarily with existing buildings. Our services include emergency stabilization, forensic investigation, façade inspection, repairs, adaptive reuse, and property loss consulting. I love the breadth of the work. The projects tend to have a shorter duration than large structural designs, so I’ve literally worked on hundreds of different projects over nine years. We deal with any type of structural materials, even archaic systems that are no longer built. Thornton Tomasetti has about 700 employees spread over about 25 offices, domestic and international. It’s large for a structural consultant, but nowhere near the size of major civil companies like AECOM or CH2MHill. Our Chicago office has about 125 people. My first job out of college was with a much smaller family-owned business. In comparison, Thorton Tomasetti has a much more corporate feel and much better perks. Large companies are typically able to offer better benefits. They can negotiate better health insurance deals and tend to standardize fringe benefits like providing continuing education, maintaining licensure, and free lunch during inter-office presentations. I think the size of our company also enabled it to weather the economic downturn better than smaller firms who are more dependent on fewer clients. Thornton Tomasetti was able to diversify its services and position themselves to grow quickly with the improving economy. 4. Tell me about an interesting project you’ve worked on with Thornton Tomasetti. What made it interesting for you? My current project is probably the most significant project of my career to date. We are renovating an existing 1920s seminary building on the campus of the University of Chicago. The building sits on one side of the main campus diag and will be the new home for the economics department. The importance of the real estate demanded an audacious design. To start, the building is being fully upgraded for modern energy-efficient HVAC. Since the roof is an historic gable, the new mechanical equipment had to be located in new underground mechanical rooms. The existing courtyards of the building were excavated to provide the additional space, but first we had to underpin the adjacent structure. We worked with a local earth retention contractor to develop a jacked-pile system which uses the weight of the existing structure as counterweight to driving friction piles to a depth of about 30 feet. The east courtyard was excavated to create a new underground classroom. The need to provide a ramp into the main building entrance complicated the design of the lid by breaking up the structure span. Given the prominence of the classroom, the architects also specified clearstory windows in the walls of the ramps and large planters in between. We eventually settled on a post-tensioned beam design to span the classroom while maintaining the ceiling clearance requirements. The only way to work out the geometry was through 3-D modeling. The whole design was modeled in Revit, a 3-D Building Information Modeling program. First the architects hired a consultant to create the existing conditions model from a laser scan of the building. From there, each consultant produced their own models to be superimposed for coordination. Throughout the building interior we demolished new wall openings, designed lintels, infilled openings, cut in new shafts, etc. to facilitate new means of egress and service lines. The building is currently under construction. As the project manager, I am first to get calls from the field when something isn’t working out as planned. I’ve had to learn to think fast on my feet and have the confidence to execute revisions to the plan. This complicated project is a real test of my technical knowledge and developing management skills. This challenge is what keeps it interesting day to day. 5. You’ve worked on projects in Dubai and Denmark, how can CEE students prepare for an international career? I was very lucky to be chosen to participate in a 6-month exchange program between Thornton Tomasetti and a Danish firm. In Denmark, I basically worked as an entry-level engineer on their typical projects. At first, I was surprised by the differences in construction materials and techniques. It really opened my eyes to the diversity of the construction industry worldwide. To land an international opportunity it’s foremost important to work for a company that has offices or large projects over-seas. Fortunately, many sizable US firms have an international presence. Some companies, like Arup, are based internationally and have satellite offices in the US. When the opportunity arises, you then have to act quickly to volunteer or make your interest known. I think it’s a common misconception that firms carefully craft a career path for their employees. It’s entirely up to each individual to set their career goals and take steps to achieve them. International assignments often open up for younger staff, because older employees will have families and commitments at home. We have one project engineer on staff that has been on the road almost continuously throughout his 5-year history with Thornton Tomasetti. He works primarily in property loss consulting, offering our structural engineering services to insurance companies. His most recent assignment was in New Zealand in the aftermath of the Christchurch earthquake. 6. What do you do with your free time? I have a two-year-old daughter, and I spend most of my free time with her. I’m amazed by her endless curiosity and wonderment of any new thing. Each day the whole family, wife, daughter, and dog, take a long walk through our Chicago neighborhood. It may seem mundane, but it really is the best part of my day. I also make time to play soccer each week. Currently, my company has teamed with one of our architect clients to compete in a co-ed league.